All Our Yesterdays is one of those books I cannot believe more people don’t know about. Okay, it has only been out for a few days, but I’ve been so excited about this for months. It feels like it should have exploded into a literary phenomenon by now. And with a premise such as this, I fully expect it to. All Our Yesterdays was one of the rare books that I could not put down. I actually felt physical withdrawal symptoms when I was required to stop reading. I solved that problem by not stopping. I finally succumbed to sleep in the early hours of last night, but woke up the next day and read until I had finished. It was that good. And here is why. 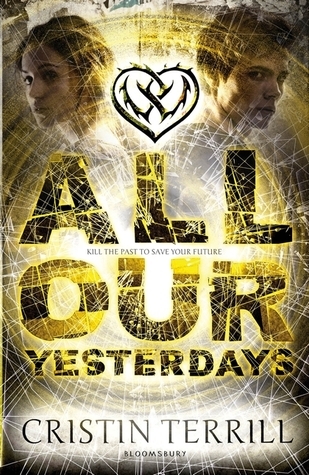 All Our Yesterdays is everything a dystopian time-travel story should be. It’s dark, it’s deep, filled with flawed characters, complex relationships and high stakes. It’s cleverly written, with the narrative switching between the past and the present so that you’re kept guessing until the end. Do I think there was room for improvement? Sure. It doesn’t marr my five-star review, but I would have loved for it to be longer, with more details of the characters’ journeys (the news that there will be a sequel greatly pleases me). I think Finn was a bit too perfect, in comparison to James and Marina who were fantastically flawed and realistic characters. Marina’s whole “inner journey” did feel a bit out of place to me. While learning to love yourself is an important life lesson; you are trying to save the world (!) – your self-esteem issues should not have been such a massive side plot. I also hate love triangles, but I can’t deny that this one really worked for the story. Concerning the timey-wimey wibbly-wobbly stuff (technical term), yes there were some instances where I could nitpick at the details. I am a highly advanced Whovian and I think I have earned that right. But when it comes to theories of time-travel, there is no correct answer. There are scientists out there of genius intellect still arguing over how it could work, if at all. The disagreements I had with this book’s portrayal of time travel were so minute and didn’t affect my enjoyment of the novel at all. In short, I loved this book. It had all of my favourite elements and had me hooked from the very start. One of the best books I have read all year, and a solid all-time favourite!